I love the colors, the style, the accessories. This is perfect for spring! I love this dress and these colors on you!! And I think I need to get this sunglasses!!! I have been so into sunglasses since I met you!! Hahaha!!!!! Wow oh wow! !This is such a gorgeous dress.So pretty and classy.You look fantastic in it and I love the tiny bag too. this dress is Spring, I am obsessed with the colors and the OTS is perfect. Oh and there is a slit, done, amazing! This dress is too gorgeous! I just love the colors and pattern. I have a few Show Me Your Mumu dresses hanging out on my Nordstrom wish list right now 🙂 I am jealous of your 85 degree weather–it’s supposed to snow here tonight! This dress is absolutely STUNNING! The colors and the whole silhouette! Now I want it for my mini-moon!! okay–seriously obsessed with this number and your nails!! Plus, your palm leaf clutch on Instagram really has me swooning–you’re so tropical!! This dress is gorgeous, Shauna! I was just looking at a few of the solid Show Me Your MuMu dress the other day and wondered how they fit. This print is SO much better than the solid versions!! I’m a sucker for pink and purple. I’m glad to hear that the weather is nice for you, I wish it would hurry up and be nice here too!! Have a great week! Such a gorgeous, romantic dress. You look so lovely in it. So jealous of your weather. It’s in the twenties here and we just got a fresh snowfall last night. This is definitely all spring and you look spectacular. Loving all of the details girl! Ohh this dress is so pretty! You look like you’re ready for a tropical vacation! This dress is SOOO pretty! I’m obsessed. *heart eyes* Happy Monday! This maxi dress is absolutely stunning! Love the print! Ahhh what a gorgeous dress! I just love that print and the colors. I love this dress! The colors are so pretty. Your nails are perfect too! Wow. You look gorgeous. I LOVE everything. The dress is just darling. The colors, accessories, manicure and clutch is perfect. I just recently learned about Show Me Your Mumu. Not sure what rock I’ve been under, but better late than never. You are a vision of spring! You look fabulous! 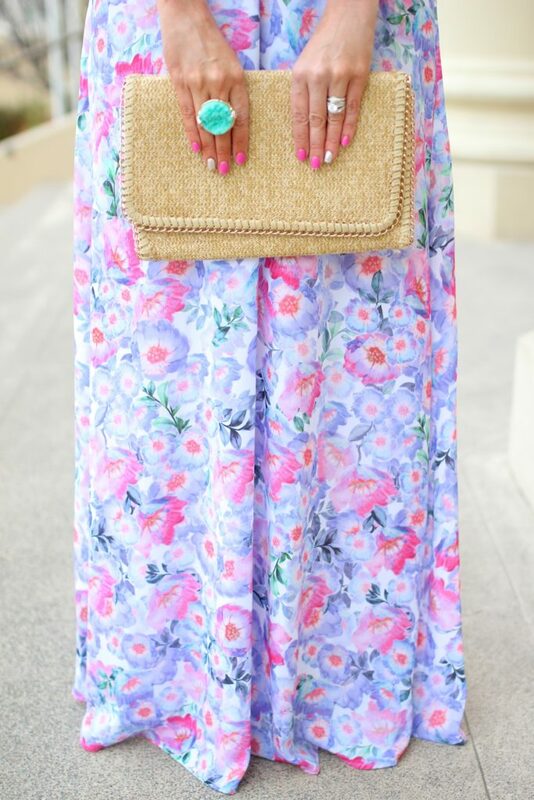 I love the bright colors of this maxi! You look gorgeous! This maxi dress is gorgeous, and making me dream of summer days! You look beautiful! Hope you are having a great start to the week! The colours are absolutely amazing in this dress! This dress is so pretty! The colours are stunning and gives the feeling of spring! adorable look! I’m madly in love with your dress! Hi Shauna, I love your hair. You have the best blond color ever! And this maxi dress looks gorgeous on you, sweetie! You are like a ray of spring sunshine is this look, lady- gorgeous floral! This is such a perfect spring dress! I thought I was ready for spring but now my area is getting snow. absolutely beautiful look, perfect mix of colors! I fell in love with this look the moment I saw it on IG! This dress is absolutely gorgeous, I love the colors and print, plus the ruffle OTS! I also love your accessories; you always have the BEST accessories! Thanks for sharing, beauty, and I hope you’re having a great day so far! Hey I didn’t realize you lived in the OC, I thought you were in LA. I live in South OC, love it down here, we went swimming in our pool on Sunday, it was awesome. Bring on the summer! Love this floral dress on you! So pretty. This dress is perfection on you!!! LOVE LOVE LOVE!!!! The colors of this dress are so perfect for you! I have never tried out MuMu maxis but I think I’ll have to! OH girlllll you look stunning! This dress is so pretty and I’m feeling all the spring vibes! That dress is stunning! I love the bright floral print! Such a pretty dress! LOVE those colors on you! Wow, I think you skipped spring and went right to summer! Love the gorgeous bright floral! Dress colour is so cool. Perfect for summer. I love your dress ! Flower print are so lovely ! I am head over heels for this maxi dress! I love the colors and off the shoulder style. Oh Shauna, you always have the prettiest outfit inspiration for me. I am over-stimulated by the gorgeous floral prints and colors! Plus, it has a slit! Double bonus!